Allen bradley Compact logix Systems for higher performance and completely distributed architecture. The SIMATIC S7-300 has been designed for innovative system solutions with the focus on manufacturing engineering and as a universal automation system, it represents an optimal solution for applications in centralized and distributed configurations. We are well-established organization, engaged in offering first class PLC Based Systems. Our systems are designed using finest material and leading technology as per the customer’s requirements. These systems are well checked on various quality parameters in order assure the quality. Small- and medium-scale control with 1, 024 points - High-speed processing: 0.2/step - On-line editing - Change I/O value by force - Small- and medium-sized manufacture line control by network Downsizing and high performance - Various special modules: analog, HSC, PID, positioning, etc. PLC trainer set up is designed to demonstrate working capabilities of PLC, its programming and ladder logic. The setup is working model of water filling system consisting of different types of inputs (6) /outputs (3) like float switches, micro switch, solenoid valves, pump and push buttons. With the support from our skilled professionals and high-end technologies, we are offering highly efficient PLC System to our clients. The FBs-PLC has more than 300 instructions which adopts a user friendly and readable multi-input/mtulti-output function structure. With this multi-input instruction structure the user can derive many types of functionality which other brands of PLC’s may require the use of many instructions to achieve this. This particular range comprises of some specialised panels which are integrated for making specific application go easy and hence save time. 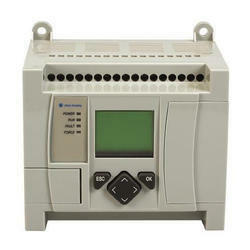 The integration of these control systems is done keeping in mind the basic but critical requirement of an industry.